It was just last weekend, on Donald Duck’s birthday, that I wrote some reflections about my experience with grief in the nearly three years since Ben left this world. Today, I made some new observations. Classes ended yesterday in NYC public high schools. Today, NYS Regents exams began. I’m on the late proctoring schedule, and since I am devoted to my Fitbit and daily walks, I decided to walk to school, a little more than four miles from my apartment. It was a beautiful day, not yet too warm (I do not like summer heat). As I do every morning to begin my day, I put on my playlist of “Ben songs”- songs that were important to him and to us. Then, I listened to the Beatles album “Hard Days Night.” Ben loved the Beatles and I have developed a strong attachment to their music because of him. After all, the first time we ever danced together was to “Twist and Shout.” Maybe not the most romantic song, but there was magic when we danced that first time. As I walked to school, I thought about Ben and how life has changed since my caregiving days. Today, I woke up at my regular time and had the luxury of deciding to leave early enough to take more than an hour to walk to school. When Ben was here, I still would have been happy to have extra time because I could have stayed with him longer and not have had to rush through getting him set for the day. When he did have a private caregiver, on a day like today, I could have stayed home until she arrived, so neither of us had the anxiety of his being alone for any amount of time. Right now, it’s all about me, and, to be perfectly honest, I’m not so comfortable with that. Although it’s close to three years since I lost Ben, my mind still quickly reverts to my caregiving days and memories of my schedules. When I’m thrust back to those days, it sets into motion a kind of movie in my head about the chaos of juggling work and caregiving. Then, I seemed never to be able to walk at the right pace, or fast enough, to get where I had to be. I continue to replay the following scenes: the panic of Ben being alone; constant texting to check on him; receiving an urgent text from him that I needed to rush home because he needed to use the commode, and then comforting him if I didn’t get home in time; getting his “10-4” or “copy that” texts after I sent an update; walking through the streets with my phone in hand just in case something happened (for a while, it could have been my dad or Ben). The movie in my head did not make me cry today. It didn’t even unnerve me. It does not feel like a setback. I find that I am so keenly aware of Ben’s absence, and yet, of his constant presence. I don’t feel the same guilt about my “freedom” that I initially felt. However, sometimes I wonder if I will ever really be free, because I am so tied to those memories. 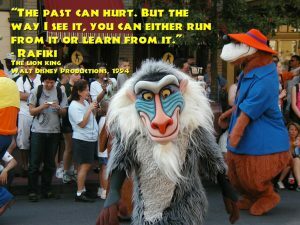 As Rafiki said, “The past can hurt. But the way I see it, you can either run from it or learn from it.” Maybe I have reached a point where I realize and can embrace that certain seemingly mundane or small events- even a shift in my daily activities like walking to work- will always remind me of Ben and our ALS days. Maybe these memories are becoming a kind of comforting reminder that despite the very ugly struggles of Ben’s brave battle with ALS, my caregiving days and our relationship during that time were incomparably and indefinably loving and meaningful and that now, Ben stays with me, even as I keep walking forward and looking for my new right pace.